It’s pouring rain and 7:30 on a Saturday morning, and a flock of birds out back is hard at work hunting worms. No weekends off for robins and quail, and why isn’t it robin and quails? Is there no fairness in this world, that fragile beauties such as these must toil in the cold and wet, and not even a lunch break? Of course it could be argued that their entire lives are one long lunch break. Still, one feels sorry for the wild creatures that have no warm shelter or cozy bed. Maybe they’re used to it, don’t suffer as much as we civilized beings would. But as this is written a once-feral cat is glommed to his human, warm and dry – and showing no inclination to venture outdoors. 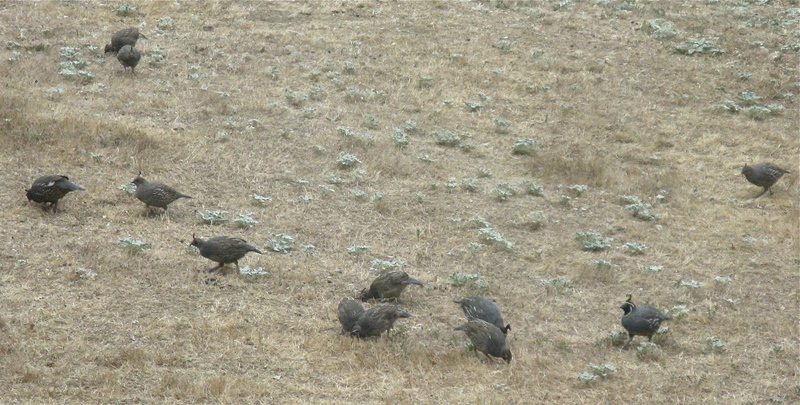 Tags: birds, quail. Bookmark the permalink.